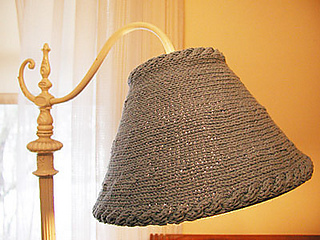 From the pattern: "A few weeks ago, I saw a crocheted lampshade in a design magazine, and started thinking about knitting one. I originally thought of knitting it in the round, with frequent increases, but it didn’t go well. Trying to see how the light would look shining through the stitches, I wrapped Blue Collar (from Scarf Style, designed by Teva Durham) around my lampshade (yes, my boyfriend does think I'm crazy), and realized I could shape the shade by short rowing instead of increasing. Essentially, you'll be doing 2 things at once: working a cable at the beginning and end of each row, and working short rows. The cables continue through the short rows, so the two cables won't necessarily cross in the same row, after the first repeat. However, you should learn fairly fast how to tell when it's time to cross, based on the distance from the last cross."